Modernist Islam was a major intellectual current in the Muslim world during the 19th and 20th centuries. Proponents of this movement typically believed that it was not only possible but imperative to show how "modern" values and institutions could be reconciled with authentically Islamic ideals. This sourcebook brings together a broad range of writings on modernist Islam from across the Muslim world. It makes available for the first time in English the writings ofmany of the activists and intellectuals who made up the early modernist Islamic movement. 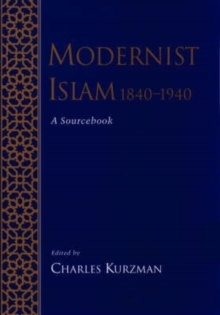 Charles Kurzman and a team of section editors, each specializing in a different region of the Islamic world, have assembled, translated, and annotated the work of the most important of these figures. With thepublication of this volume, an English-speaking audience will have wider access to the literature of modernist Islam than did the makers of the movement themselves.